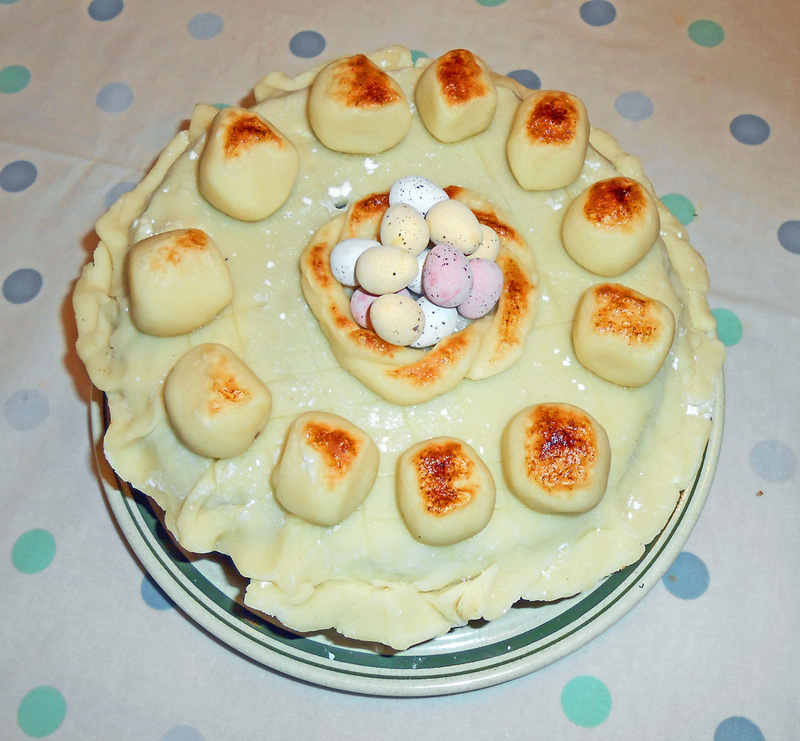 Welcome to the March 2017 issue of our occasional newsletters. 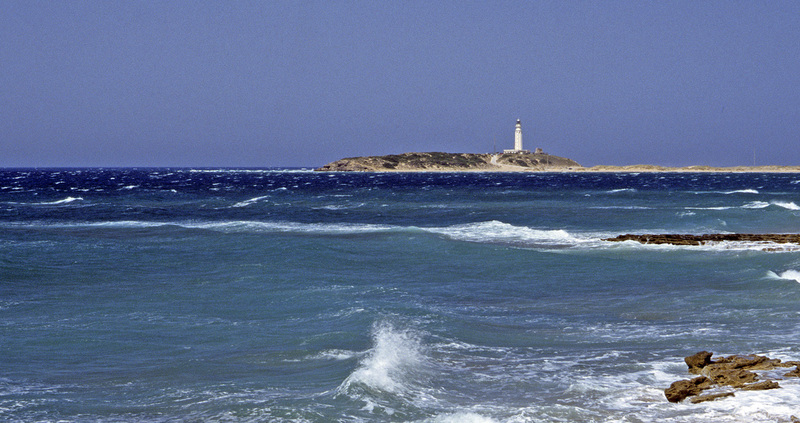 Over the centuries, many ships have foundered in bad weather off Cape Trafalgar on the rocky southern coast of Spain, where in 1805 the Battle of Trafalgar was fought. In this same area during World War One, HMS Britannia was hit by a torpedo fired from a German submarine. Built in Portsmouth, HMS Britannia was launched in December 1904 as a battleship of over 16,000 tons, with four 12-inch guns, four 9.2-inch guns and ten 6-inch guns, and was completed in 1906. That same year saw HMS Dreadnought enter service, a new type of battleship armed only with 12-inch guns and capable of greater sailing speed, making previous battleships obsolete – including HMS Britannia. Even so, the Britannia was still very powerful and continued to be a useful part of the navy. On the morning of 9th November 1918, the Britannia was sailing off Cape Trafalgar, accompanied by two other warships, only to be hit by a torpedo fired from the German submarine UB-50. A fire spread to the magazine, and it proved impossible to flood the area to put the fire out. It was obvious that the vessel could not be saved, and many of the crew were taken off. Just over three hours after being struck by the torpedo, the Britannia sank. The UB-50 escaped the depth charges, and by now the Britannia was close to sinking, which the Western Morning News described: ‘As the Britannia was still heeling over, the remainder of the officers and crew were put on board other vessels that had arrived from Gibraltar. Soon afterwards the ship turned turtle and went down in deep water.’ Fifty men were killed, most of whom went down with the ship. This was the last Royal Navy ship to be sunk in World War One, just two days before Armistice Day, and this was the last ship sunk by the submarine UB-50, which surrendered in January 1919. 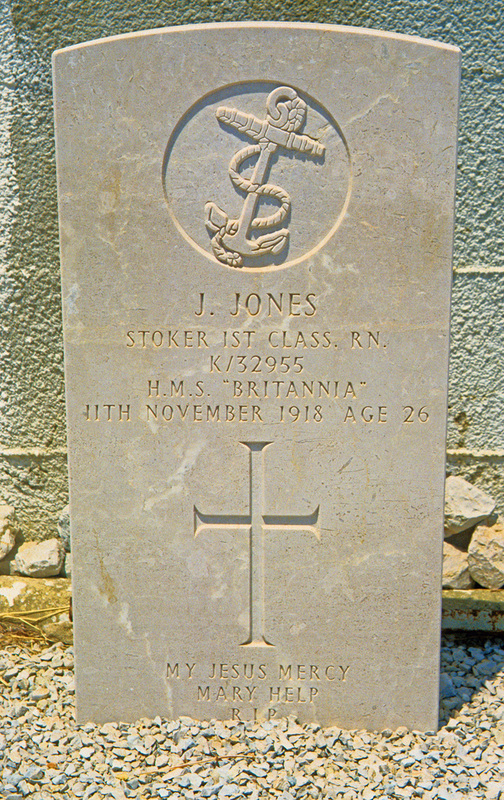 Several wounded men from HMS Britannia were left at Gibraltar, where they could be treated, including John Jones, a stoker. Born in January 1892, he was twenty-six years old, described as being five feet seven inches tall, with black hair and grey eyes. He came from Irlam, near Manchester in Lancashire, and before he joined the navy, he was probably still living at home with his parents, Charles and Bridget Jones, as well as his two brothers and four sisters, and he worked as a labourer in a soap works. On joining the navy in November 1915, he stated his religion as Roman Catholic and named his mother as next-of-kin. After four months of service, he was rated able seaman, and by November 1918 he had become a stoker first class. Jones was badly wounded and died two days after the Britannia sank. The date of his death was 11th November, which, poignantly, was Armistice Day. He was one of the last servicemen to die during World War One, and he was buried in the North Front Cemetery, in the shadow of the Rock of Gibraltar, where his grave can still be seen. 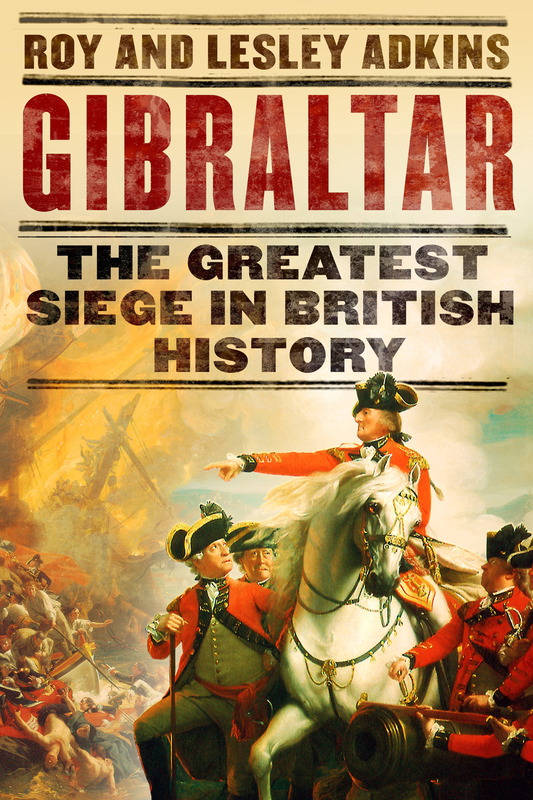 Our next book is Gibraltar: The Greatest Siege in British History. For over three-and-a-half years, from 1779 to 1783, the tiny but awe-inspiring fortress of Gibraltar, between the Mediterranean and Atlantic, was besieged and blockaded by overwhelming Spanish and French forces. A place of varied nationalities, languages and religions, Gibraltar’s civilian and military population endured terrifying bombardment, starvation and disease. Ordinary people lived through extraordinary events, from shipwrecks, naval battles and an attempted invasion of England to deadly innovations of shrapnel shells, red-hot shot and floating batteries. The longest siege in British history, it was blamed for the loss of America. Our book will be published in the UK by Little, Brown on 7th September 2017 (ISBN 978-1408708675), and in the USA by Viking Penguin in 2018. We will keep you informed once more details are available. Because we have been so immersed in writing our new book, there has been little time recently to write magazine articles or do talks and other events, with two exceptions. We very much enjoyed giving a talk to the Jane Austen Society’s South-West branch in Exeter on ‘All at Sea with the Austens’, in their first event of 2017, in what is a momentous year – the 200th anniversary of the death of Jane Austen in July 1817. We have also had a two-page article published in the BBC History Magazine (February 2017 issue), on pages 86–7. It was within their regular feature called ‘My Favourite Place’, and we described visiting military history locations on Gibraltar, from the Moorish Castle to World War Two gun batteries. Our next talk is for the Jane Austen Society Kent Branch on Saturday 3 June 2017. Jane Austen had very important connections to the county of Kent and often visited family members there. Our talk will be part of the Kent branch summer event, and the venue is Court Lodge, Lamberhurst, Tunbridge Wells, Kent. It will include an organ recital of music from Jane Austen’s period, a talk by Dr Heather Dyke, owner of Court Lodge, about her family’s connections to the Austens, our own talk (‘All at Sea in the Time of the Austens’) and an Austen-related exhibition by the Horsmonden Historical Society. For more information about this event and how to join the Kent branch, see their website. Theme parks, offering a variety of complicated fairground rides, have done much to eclipse the popularity of travelling funfairs. Yet the one advantage of fairs is that they do travel, taking their rides to places far and wide. 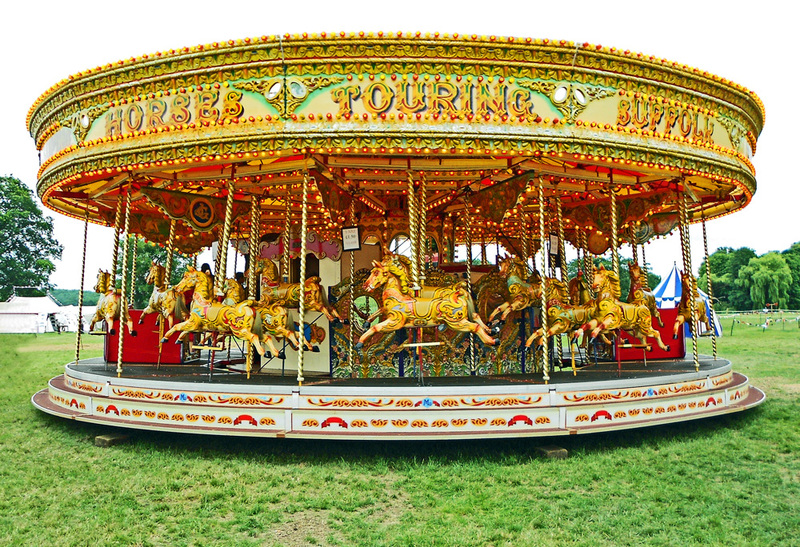 Compared to the attractions at a static theme park, the roundabout (also known as a carousel or merry-go-round) may seem tame, but it has a long history, and primitive roundabouts were one of the first types of travelling fairground rides to appear. The earliest examples were not much more than horizontal wheels with seats, powered by men who stood within the rim of the wheel and pushed on the spokes while walking round and round. Eventually, like small mills and similar machinery, roundabouts were powered by a horse turning another wheel connected to the roundabout by a belt. Dobbies (singular: dobby) were roundabouts that had wooden horses hanging by a single pole from the roof. There was no floor to the roundabout, and no mechanism to make the horses rise and fall. Originally designed for use by children, larger versions were later made for adults, and on some dobbies the poles were hinged at the top, allowing the horses to swing outwards as the ride gathered speed. Although they were later run by horse power and then steam power, early dobbies were powered simply by people pushing the roundabout round. The big roundabouts in travelling fairs known as gallopers developed from dobbies, and they have large wooden horses, made for adults rather than children, carved to resemble galloping horses. Each horse is fixed to a vertical pole that raises and lowers the horse, giving roundabouts their distinctive appearance when in motion. Steam power was first developed for pumping engines, then for railway locomotives. By the late 1860s the steam traction engine was fast becoming a common method of hauling heavy loads along the roads of Britain and was the first self-propelled vehicle to replace horses for heavy haulage. While horses were still the norm for individual riders and for pulling passenger vehicles, they could not compete with the traction engine for raw pulling power. 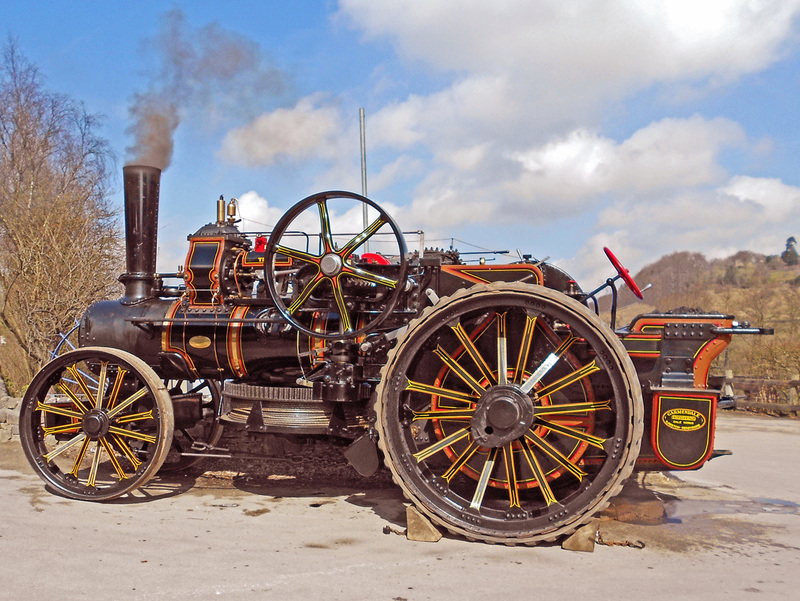 Traction engines were large, heavy and slow, but they had a number of advantages for travelling showmen. As well as pulling huge loads of equipment from one venue to the next, steam engines also provided electricity, via a generator, to power the fairground rides and lighting. On the road, the footplate of a traction engine, like that of a railway locomotive, provided warmth from the adjacent furnace heating the boiler, and a canopy over the engine usually kept off the worst of the weather. It was steam power that gave late 19th- and early 20th-century fairgrounds their distinctive atmosphere. Traction engines provided plenty of electricity, so rides and stalls were covered in bright lights for the first time, making fairs more appealing to a wider section of the population. 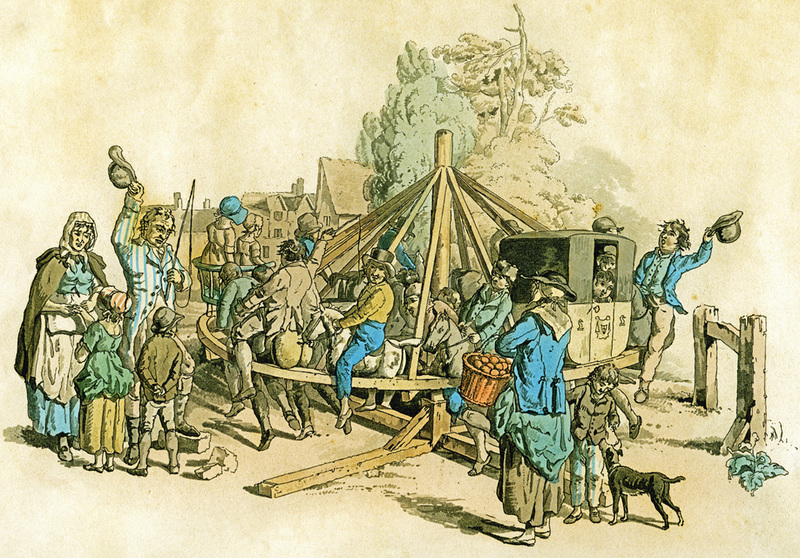 The abundant power was also used to run fairground organs and other mechanical music machines, adding to the attraction of stalls and rides. The traction engines themselves were a novelty, and the sound of running engines became a familiar background noise for fairs. The smoke from ‘steam coal’ (the particular grade of coal best suited to steam engines) gave fairgrounds a distinctive aroma that is completely lacking from fairs powered by diesel or petrol generators. Always ready to adopt new technology, after the Second World War fairgrounds abandoned steam engines in favour of generators, but many people were nostalgic for the pre-war fairs and so enthusiasts began to hold steam rallies and steam fairs, powered by traction engines, and these events continue to be incredibly popular.